Leading experts contribute articles dealing with structural, theoretical, analytical and chemical aspects of the many functional groups containing sulphur. Chapter 1: General and theoretical (Tova Hoz, Harold Basch). 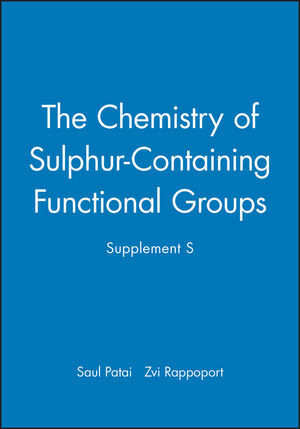 Chapter 2: Structural chemistry of organosulfur compounds (Béla Rozsondai). Chapter 3: The conformational analysis of sulphur-containing rings (F. G. Riddell). Chapter 4: Thermochemistry of organosulphur compounds (Joel F. Liebman, Kristine S. K. Crawford, Suzanne W. Slayden). Chapter 5: NMR and ESR of organosulphur compounds (Alan R. Bassindale, James N. Iley). Chapter 6: Mass spectra of organosulfur compounds (Nico M. M. Nibbering, Steen Ingemann, Leo J. De Koning). Chapter 7: Carbon acidity resulting from sulfur substituents (Gernot Boche, John C. W. Lohrenz, Jerzy Cioslowski, Wolfram Koch). Chapter 8: (Thiyl radicals (C. Chatgilialoglu, M. Guerra). Chapter 9: Pyrolysis of organosulphur compounds (Gonzalo Martin). Chapter 10: Electrochemical behavior of organic molecules containing sulfur (Jacques Simonet). Chapter 11: (Syntheses and uses of isotopically labelled compounds with sulphur-containing functional groups (Mieczysaw Zieliski, Marianna Kaska). Chapter 12: Soft metal ion-promoted reactions of organo-sulphur compounds (D. P. N. Satchell, R. S. Satchell). Chapter 13: Thiol - disulfide interchange (Rajeeva Singh, George M. Whitesides). Chapter 14: Vinyl sulfides (Boris A. Trofimov, Bagrat A. Shainyan). Chapter 15: High-coordinated sulfur compounds (Józef Drabowicz, Piotrlyzwa Marian Mikojczyk). Chapter 16: Biological activity of sulfoxides and sulfones (Asher Kalir, Henry H. Kalir). Chapter 17: Organic sulfur in the geosphere: analysis, structures and chemical processes (Eitan B. Krein).